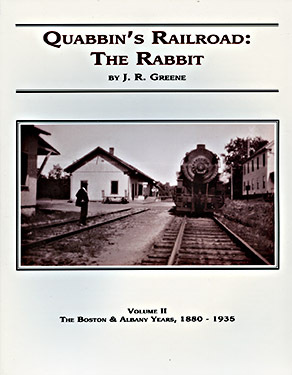 THE STORY of “The Rabbit”—a 48-mile long railroad that passed through all four of the towns that were drowned in the course of making the Quabbin Reservoir—is told in detail in these two volumes by well-known central Massachusetts and Quabbin Reservoir historian J. R. Greene. The railroad’s reputation as one of New England’s most legendary short rail lines was cemented by the flooding of its northern half by the reservoir. All aspects of the railroad’s story are here: the politics and business manipulations, the colorful people who built and operated it, the operational foul-ups and tragic accidents, profiles of the towns and villages through which it passed, and numerous, rare photos and illustrations. 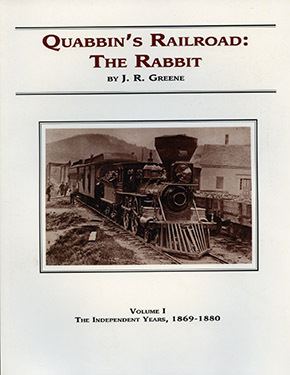 Volume I of Quabbin’s Railroad: The Rabbit details the independent years of operation from 1869 through 1880: how the line was built as the Athol & Enfield Railroad, extended to Springfield and completed as the Springfield, Athol & Northeastern, foreclosure and continued operation as the Springfield & Northeastern, and its eventual absorption by the Boston & Albany Railroad. Volume II continues the line’s story through over half a century of operation as the Athol Branch of the B&A, including details of the line’s decline and demise in the 1930s, the loss of the northern half of the line to the Quabbin, and the irreversible damage from the 1938 hurricane and floods.